New Fast Reliable Print Mark Detectors from Balluff - New Contrast Sensors from Balluff are Designed for Fast, Reliable Print Mark Detection - Balluff’s new line of BKT 67M contrast sensors are perfect for detecting brightness differences in parts, labels, and imprints on packaging. Balluff’s new family of BKT 67M contrast sensors can detect even the slightest contrast differences in challenging packaging applications. 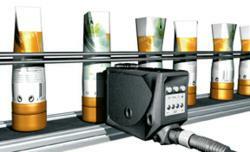 These sensors are specifically designed for fast and reliable print mark detection. The BKT family of contrast sensors feature a rugged metal housing, and a rotatable connector plus variable mounting to enable use under harsh ambient conditions. A clear, user-friendly operating display ensures rapid startup. High switching frequencies (up to 30 kHz) allow for color mark detection on demanding applications. The sensor can also be set dynamically without having to stop processes. Depending on the complexity of the application, the BKT is available in a basic, advanced, or premium version.